Front's notification settings give you fined tuned controls over the alerts you receive for new activity in Front. You can choose from one of our default modes, or create custom notification rules for specific situations. You can manage your notifications for desktop, email, and mobile independently. 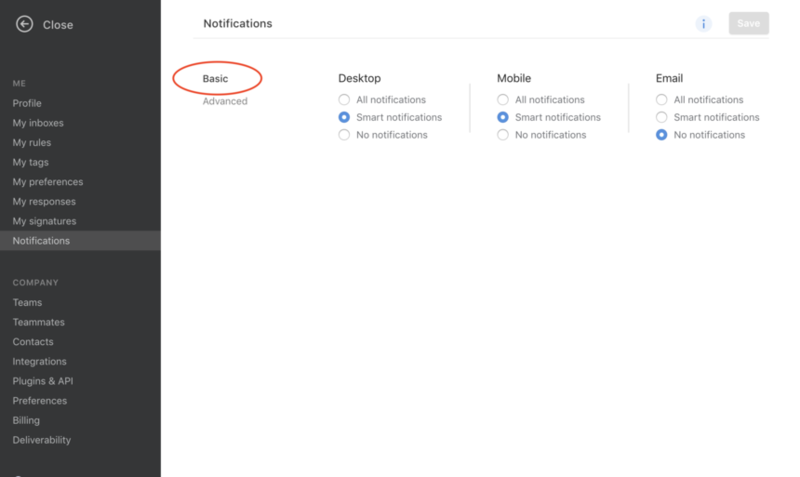 Set a Basic notification mode (“all”, “smart”, and “no notifications”) for each platform, and you can also use Advanced notification rules to customize them further. Go into your Settings, and select Notifications. Choose your Basic notification modes for desktop, email, and mobile. Click Save. 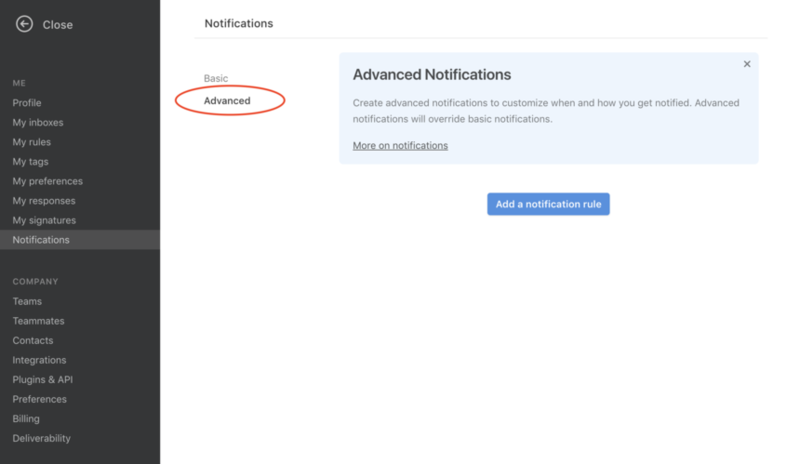 You can use Advanced notification rules to customize your notification settings further and trigger notifications for exactly what you need. If you use a lot of advanced notification rules, we recommended switching to No notifications for your Basic modes and just building rules for the notifications you need. In your notification settings, click Advanced. Click Add a notification rule. 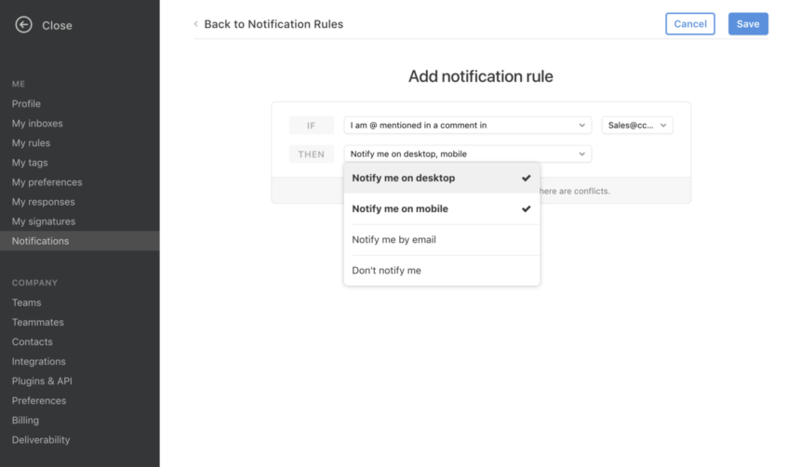 Create your notification rule with your desired conditions to create a custom notification. These if-then rules will override the defaults of your chosen Basic modes. For example, here we’ll create a rule to notify me on desktop and mobile when I’m @mentioned on a conversation in our Sales@ inbox. If rules conflict, the more specific rule will override the more general rule or your notification mode. For example, if the conditions for a rule that says "don't notify me" are met, there won’t be a notification — even if there your All or Smart notification mode would normally notify you. Follow these instructions to turn off or turn on audio notifications for Front. Desktop notifications are sent immediately. Mobile notifications are delayed by 20 seconds (and sent if the message has not been seen). Email notifications are delayed by 3 seconds (and sent if the message has not been seen). I followed these instructions and I still can't notifications on my phone for my text inbox for my twilio number, any suggestion? Are you using an iPhone or Android? And do you have notifications enabled in your phone settings? Android. I'm accepting all notifications in my phone for front. I get all notifications for emails. Kyle Schanzer Can you try enabling the option A contact sends a new chat message in your notification settings? Let me know if that fixes the issue. Cori Morris I changed it, but that didn't work. I do get a notification on my desktop when i get an sms before i turned on the chat notification option. Kyle Schanzer Ok, we can try one more thing from our end. In order to do that, we will need your account information. Can you send us an email to get this going? Is it possible to get incoming mail notifications on my phone while I'm marked as 'Out of Office'? I'm currently set up to receive notifications of any incoming emails to a specific Inbox. I will mark myself as 'Out of Office' at the end of my shift to ensure replies/follow-ups come through to the Unassigned view for maximum visibility. However this currently means I no longer receive the incoming notifications. I'd like to be able to keep an eye on this Inbox, while ensuring any of my open queries are dealt with by my teammates quickly. Jem Wilkinson Hi there, do you have the 'Do Not Disturb' setting enabled? On mobile, go to Settings > Notifications and see if you have it enabled. If it is, you'll want to disable that. Cori Morris I have never enabled this feature. I just checked, and it does not turn on by default when I mark myself 'Out of Office'. Jem Wilkinson Ok. What notification are you not getting that you should be getting? I see that you have some notifications disabled on mobile. Cori Morris In the first 'Helpdesk' Inbox, I have specific notifications set up to alert my Phone to any incoming email. Throughout the day, I am notified of any new emails to that Inbox, but once I sign out these are no longer received. Jem Wilkinson, When you log out, you won't receive push notifications anymore. Cori Morris My question is, is there no way to receive them once I log out? I would still like to receive notifications on my phone (like incoming mail, or @mentions), while allowing the conversations I'm dealing with to go through to 'unassigned' if they are updated. I guess what I'm trying to say is my reasons for 'logging out' are not necessarily the same as if I wanted to activate 'do not disturb'. Jem Wilkinson you should still be able to receive mobile notifications if you are logged out on your desktop. The specific setting you would want to look at for this would be "whenever a message is sent or received". You can always specify for which inboxes you want a notification for by toggling from "All Inboxes" in the notification settings. William Hearn Yes, you can turn this off sound notifications in your computer settings. Is there a way to change the notification sound? The notification sound is actually linked to your computer, so it's whatever sound options your computer has. Front doesn't have our own notification sound selection. How do we go about getting a desktop notification for only new tickets/emails into our group inbox but not for responses to any other ticket/email?